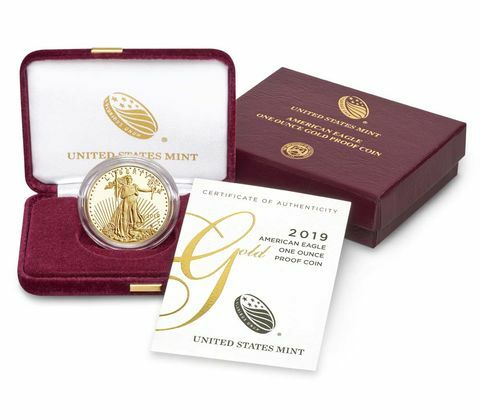 WASHINGTON – The United States Mint (Mint) will open sales for the 2019 American Eagle Gold Proof Coins on March 7 at noon EST. Product options are below. The individual coins and the four-coin sets are packaged in satin-lined burgundy velvet presentation cases housed inside a burgundy outer box. All options include a Certificate of Authenticity. Coin prices are based on the range in which they appear on the Mint’s current pricing grid for numismatic gold, commemorative gold, platinum, and palladium products, available at catalog.usmint.gov/coins/gold-coins/. American Eagle Gold Proof Coins are the collector versions of the Mint’s American Eagle Gold Bullion Coins. Launched in 1986, these 22-karat gold coins display the “W” mint mark of the West Point Mint where they are produced. The coins’ obverse (heads) design features a version of Augustus Saint-Gaudens’ full-length figure of Liberty with flowing hair, holding a torch in her right hand and an olive branch in her left. The reverse design (tails), by sculptor Miley Busiek, features a male eagle carrying an olive branch while flying above a nest containing a female eagle and eaglets.